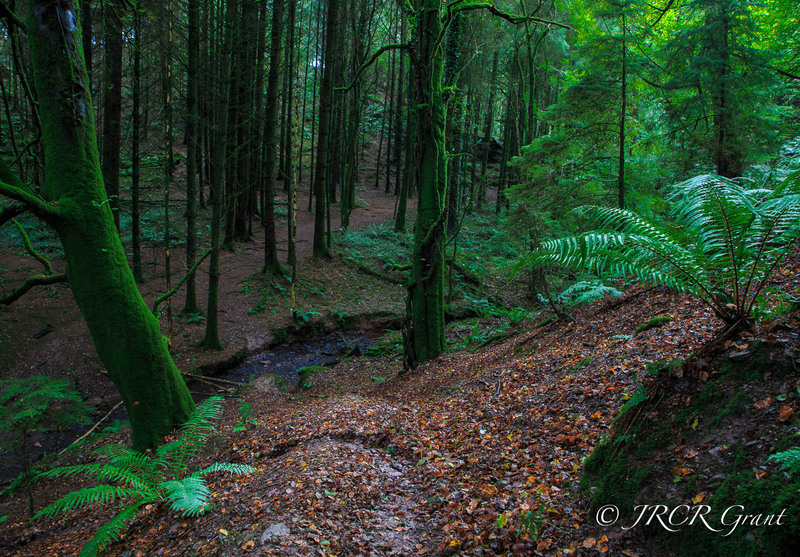 Another shot within Garryduff Woods, with the bright green of moss and ferns contrasting with the fallen leaves on the ground. Here the land drops sharply to a stream where its waters tumble down an obstacle course, occasionally lingering in a pool as if to catch breath, before cascading on down to its destiny with the sea. On hotter days the stream acts as a refreshment stop for The Hound and a place to cool down. Otherwise it is simply somewhere to splash around and frolic. My didn’t it get dark early last night. Winter is upon us. Too good MM. Did those leaves crunch underfoot? That green is so captivating ! Your hound is so cute. That is a truly beautiful place! A place we like to go and right on our doorstep…. I love a mossy ferny forrest with lots of fallen leaves….the water and sea is just the icing on the cake. What a glorious place.